Objective To assess the effect of different food sources of fructose-containing sugars on glycaemic control at different levels of energy control. 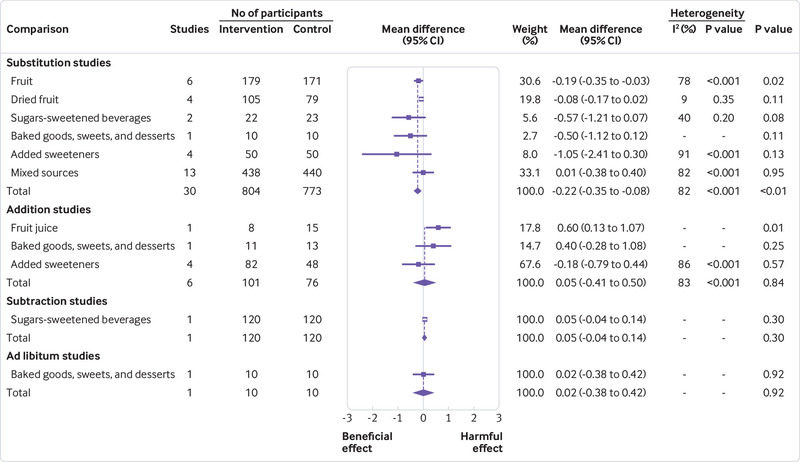 Design Systematic review and meta-analysis of controlled intervention studies. Data sources Medine, Embase, and the Cochrane Library up to 25 April 2018. Eligibility criteria for selecting studies Controlled intervention studies of at least seven days’ duration and assessing the effect of different food sources of fructose-containing sugars on glycaemic control in people with and without diabetes were included. Four study designs were prespecified on the basis of energy control: substitution studies (sugars in energy matched comparisons with other macronutrients), addition studies (excess energy from sugars added to diets), subtraction studies (energy from sugars subtracted from diets), and ad libitum studies (sugars freely replaced by other macronutrients without control for energy). Outcomes were glycated haemoglobin (HbA1c), fasting blood glucose, and fasting blood glucose insulin. Data extraction and synthesis Four independent reviewers extracted relevant data and assessed risk of bias. Data were pooled by random effects models and overall certainty of the evidence assessed by the GRADE approach (grading of recommendations assessment, development, and evaluation). Results 155 study comparisons (n=5086) were included. Total fructose-containing sugars had no harmful effect on any outcome in substitution or subtraction studies, with a decrease seen in HbA1c in substitution studies (mean difference −0.22% (95% confidence interval to −0.35% to −0.08%), −25.9 mmol/mol (−27.3 to −24.4)), but a harmful effect was seen on fasting insulin in addition studies (4.68 pmol/L (1.40 to 7.96)) and ad libitum studies (7.24 pmol/L (0.47 to 14.00)). There was interaction by food source, with specific food sources showing beneficial effects (fruit and fruit juice) or harmful effects (sweetened milk and mixed sources) in substitution studies and harmful effects (sugars-sweetened beverages and fruit juice) in addition studies on at least one outcome. Most of the evidence was low quality. Conclusions Energy control and food source appear to mediate the effect of fructose-containing sugars on glycaemic control. Although most food sources of these sugars (especially fruit) do not have a harmful effect in energy matched substitutions with other macronutrients, several food sources of fructose-containing sugars (especially sugars-sweetened beverages) adding excess energy to diets have harmful effects. However, certainty in these estimates is low, and more high quality randomised controlled trials are needed. Whether a causal link exists between fructose and the development of diabetes and related cardiometabolic comorbidities continues to be contested. But much less appreciated in this debate are the consumption patterns and levels at which fructose is normally consumed in the diet. Fructose is rarely consumed in isolation under real world conditions.14 It is present in various food sources containing comparable amounts of glucose, and the proportion of fructose co-ingested with glucose has been suggested to influence fructose metabolism.15 In its most commonly consumed form, sucrose (table sugar), fructose is part of a disaccharide with glucose in a 50:50 ratio. HFCS is also a glucose-fructose mix, with varying fructose content (42-55% molecular weight) in a free, unbound monosaccharide form. Similarly, less refined sources of fructose-containing sugars—including honey, agave, and maple syrup—are composed of varying proportions of fructose and glucose, while natural sources of fructose present in various fruit and vegetables also co-exist with glucose. These fructose-containing sugars are found in the diet in a variety of food sources, ranging from “nutrient poor” sources of added sugars (such as sugars-sweetened beverages (SSBs)), to “nutrient dense” sources of bound sugars (such as fruit). Evidence from prospective cohorts on diabetes risk have shown different associations depending on the food source of the sugars (that is, positive associations with SSBs1617 and inverse association with fruit1819). As dietary guidelines shift from nutrient based recommendations to more food and dietary pattern based recommendations,2021 it is important to understand the role of the food matrix in modifying the effect of fructose-containing sugars. Current recommendations from the World Health Organization, United States, and United Kingdom have focused on the reduction of added or free sugars (added sugars plus sugars contained in fruit juices) to less than 5-10% energy,202223 especially free fructose-containing sugars from SSBs.20 Whether the evidence for added or free sugars and SSBs can be generalised to all food sources of fructose-containing sugars in relation to their effects on surrogate markers of type 2 diabetes has not yet been determined. We conducted a systematic review and meta-analysis of controlled intervention studies to determine the effect of food sources of fructose-containing sugars at different levels of energy control on glycaemic control in people with and without diabetes. This systematic review and meta-analysis was conducted according to the Cochrane Handbook for Systematic Reviews and Interventions,24 with all results reported according to the PRISMA (preferred reporting items for systematic reviews and meta-analyses) guidelines.25 The study protocol was registered at Clinicaltrials.gov (NCT02716870). Medline, Embase, and the Cochrane Central Register of Controlled Studies were searched up to 25 April 2018. We used the following search terms: fructose OR dietary sucrose, OR HFCS OR sugar OR sugar* sweetened beverage* OR honey AND glyc?em* OR insulin OR HbA1c OR fructosamine OR blood glucose OR gly* albumin (supplementary table 1). Validated filters from the McMaster University Health Information Research Unit were applied to limit the database search to controlled studies only,26 and electronic searches were supplemented with manual searches of references from included studies. Substitution studies, in which food sources of fructose-containing sugars were compared with food sources of other non-fructose-containing macronutrients under energy matched conditions (isocaloric comparison). Addition studies, in which excess energy from food sources of fructose-containing sugars was added to background diets compared with the same background diets alone without the excess energy from fructose-containing sugars, with or without the use of low calorie sweeteners to match sweetness (hypercaloric comparison). Subtraction studies, in which energy from food sources of fructose-containing sugars was subtracted from background diets through displacement by water or low calorie sweeteners, or by elimination of the food sources of fructose-containing sugars altogether compared with the original background diets (hypocaloric comparison). Ad libitum studies, in which food sources of fructose-containing sugars were compared with food sources of other non-fructose-containing macronutrients without any strict control of either the study foods or the background diets, to allow for free replacement of the energy from fructose-containing sugars with the energy from other macronutrients (free-feeding comparison). We included reports containing both randomised and non-randomised controlled intervention studies. An intervention study was considered non-randomised if the authors explicitly stated that a method of randomisation was not used or randomisation was not reported in the allocation of participants to the intervention or control treatments in parallel designs or the sequence of the treatments in crossover designs. In reports containing more than one study comparison, we included all available study comparisons. Data from included reports were individually extracted at least twice by four separate reviewers. Relevant information included number of participants, setting, underlying disease status of participants, study design, level of feeding control, randomisation, comparator, fructose-containing sugars type, food sources of fructose-containing sugars, macronutrient profile of the diets, follow-up duration, energy balance, and funding sources. The three outcome variables were HbA1c, fasting blood glucose, and fasting blood insulin. HbA1c was reported instead of total glycated blood proteins as originally indicated in our protocol (identification number NCT02716870), because mean differences for these values were considered more clinically relevant and did not require the use of standardised mean differences needed to the different glycated blood proteins. Authors were contacted for missing outcome data when it was indicated that an outcome was measured but not reported. In the absence of numerical values for outcome measurements and inability to obtain the original data from authors, values were extracted from figures using Plot Digitizer where available.1 All discrepancies between reviewers were resolved through consensus or, where necessary, arbitration by the senior author. Included studies were assessed for risk of bias by at least two of the reviewers using the Cochrane Collaboration risk of bias tool27. Final assessments were based on consensus between reviewers. When at least two studies provided data, we performed a DerSimonian and Laird random effects meta-analysis. When fewer than five studies were available for analysis, we also considered fixed effect estimates. Heterogeneity was assessed by the Cochran Q test (significant at P<0.10) and quantified by the I2 statistic (range 0-100%).29 The interaction between fructose-containing sugars and food source was assessed by use of the χ2 statistic. Other sources of heterogeneity were explored by sensitivity and subgroup analyses. We carried out sensitivity analyses by systematically removing each study from the meta-analyses and recalculating the summary association. A study whose removal explained the heterogeneity, changed the significance of the effect, or altered the effect size by 10% or more was considered an influential study. If 10 or more studies per outcome were available,3031 we conducted a priori subgroup analyses using meta-regression. Categorical subgroup analyses were done for energy balance (positive, neutral, negative), comparator (starch, glucose, fat, lactose, maltrodextrin, diet alone, water, non-nutritive sweeteners, protein, mixed sources), fructose-containing sugars type (fruit, sucrose, fructose, HFCS, honey), fructose-containing sugars dose (≤10%, >10% energy2232), baseline HbA1c values (≤7%, >7%), fasting glucose (≤5.5, >5.5 mmol/L based on median values) and insulin (≤96.6, >96.6 pmol/L based on median values), age (≤18, >18 years), study design (crossover, parallel), follow-up duration (<8, ≥8 weeks), randomisation (yes, no), level of feeding control (supplemented, dietary advice, and metabolically controlled), underlying disease status (diabetes, overweight/obese, metabolic syndrome criteria, otherwise healthy), and individual domains of risk of bias (sequence generation, allocation concealment, blinding of participants/personnel and outcome assessors, incomplete outcome data, selective outcome reporting). We used the GRADE approach (grading of recommendations assessment, development, and evaluation) to assess the certainty in our estimates and produce evidence profiles37 using GRADEpro GDT (GRADEpro Guideline Development Tool software, McMaster University, Canada, 2015). Evidence was graded as high, moderate, low, or very low quality. Included controlled intervention studies were graded as high quality evidence by default and downgraded on the basis of prespecified criteria. Criteria to downgrade evidence included risk of bias (assessed by the Cochrane risk of bias tool), inconsistency (substantial unexplained heterogeneity, I2>50%, P<0.10), indirectness (presence of factors that limited the generalisability of the results), imprecision (if the 95% confidence interval for pooled effect estimates crossed a minimally important difference for benefit or harm for HbA1c (0.3% difference), fasting blood glucose (0.5 mmol/L difference), and fasting blood insulin (10 pmol/L difference)), and publication bias (significant evidence of publication bias). Patient and public involvement was not included in this study. We were unable to involve any patients or members of the public in the design or conduct of the study, development of patient relevant outcomes, interpretation of the results, or writing or editing of the manuscript. Figure 1 shows the systematic search and selection of literature. Of 4442 reports identified from database and manual searches, 4157 were excluded on the basis of the title and abstract. Of 285 reports reviewed in full, an additional 164 reports were excluded for failure to meet the eligibility criteria. The final analysis included 118 reportsof controlled intervention studies,511123839404142434445464748495051525354555657585960616263646566676869707172737475767778798081828384858687888990919293949596979899100101102103104105106107108109110111112113114115116117118119120121122123124125126127128129130131132133134135136137138139140141142143144145146147148149150151152 including a total of 155 study comparisons in 5086 participants. Table 1 provides a summary of the mean study characteristics by the four prespecified study designs (substitution, addition, subtraction, and ad libitum studies), with a breakdown of individual study characteristics in supplementary table 2. Study sizes were relatively small, ranging from a median of 15 participants (range 6-318) in subtraction studies to 39 participants (8-236) in ad libitum studies. Most studies were performed in an outpatient setting, with almost half of all substitution (43/108), addition (12/35), and subtraction (1/5) studies conducted in the US, and all ad libitum studies conducted in European countries. Participants tended to be middle aged, with roughly equal ratios of men to women in substitution, addition, and ad libitum studies, but proportionately more women than men in subtraction studies. Most studies included individuals with diabetes (34%, 37/108) or otherwise healthy participants (26%, 28/108) in substitution studies; otherwise healthy (34%, 12/35) or overweight or obese participants (29%, 10/35) in addition studies; overweight or obese participants (80%, 4/5) in subtractions studies; and otherwise healthy participants (43%, 3/7) in ad libitum studies. Most studies were randomised (72% (78/108) of substitution studies, 66% (23/35) of addition studies, 80% (4/5) of subtraction studies, and 100% (7/7) of ad libitum studies). Follow-up duration was relatively short, ranging from a median of 4.5 weeks (range 1-52 weeks) in substitution studies to 12 weeks (1-36) in subtraction studies. Doses of fructose-containing sugars ranged from a median of 12.2% (range 7.7-25.0%) of total energy intake in addition studies to 23% (13.0-26.0%) in ad libitum studies, and were mostly in the form of mixed food sources in substitution (45/108) and ad libitum (6/7) studies while most addition studies (12/35) and subtraction studies (4/5) used SSBs. Most studies were funded by agency sources (government, not-for-profit health agency, or university sources), except for ad libitum trials, which were primarily funded by agency-industry funding. Supplementary figure 1 shows a summary of the risk of bias assessments by the Cochrane risk of bias tool. Owing to poor reporting standards, most studies were assessed as having unclear risk of bias across the five domains of bias. Few studies were assessed as having high risk of bias, with only 20.3% (24/118), 23.7% (28/118), 1.7% (2/118), 8.5% (10/118) of studies assessed as high risk of bias for random sequence generation, allocation concealment, blinding of participants and personnel, and incomplete outcome data, respectively. Overall, no serious risk of bias was detected. Figure 2 and supplementary figures 2-5 show the effect of different food sources of fructose-containing sugars on HbA1c levels. Total fructose-containing sugars independent of food sources showed a significant beneficial effect on HbA1c in substitution studies (30 study comparisons, mean difference −0.22% (95% confidence interval −0.35% to −0.08%), −25.9 mmol/mol (95% confidence interval −27.3 to −24.4), P<0.01, substantial heterogeneity (I2=82%, P<0.001)). We saw no significant effect in addition studies (six study comparisons, substantial heterogeneity (I2=83%, P<0.001)), subtraction studies (one study comparison), or ad libitum studies (one study comparison). Although formal tests of interaction by food source were not significant in the substitution or addition studies, an interaction appeared to be present in the substitution studies, with fruit being the major driver of the effect. Fruit accounted for 30% of the weighted benefit as the only food source, showing a significant decrease in HbA1c (six study comparisons, mean difference −0.19% (95% confidence interval −0.35 to −0.03), −25.6 mmol/mol (95% confidence interval −27.3 to −23.8), P=0.02, substantial heterogeneity (I2=78%, P<0.001)). An interaction by food source could not be assessed at the other levels of energy control, because only one food source category was assessed in the subtraction studies (SSBs) and ad libitum studies (baked goods, sweets, and desserts). Sensitivity analyses for HbA1c are presented in supplementary table 3. The removal of each study did not explain the heterogeneity or change the significance of the effect. A priori subgroup analyses for HbA1c are presented in supplementary figures 6 and 7 and dose-response analyses for HbA1c are presented in supplementary figures 8 and 9. A priori subgroup analyses did not show any effect modification in substitution studies. We saw evidence of a dose threshold seen at 10% energy by MKSPLINE procedure with the largest decreases seen only at doses up to 10% energy (P=0.04). No subgroup or dose-response analyses were conducted for addition, subtraction, or ad libitum studies, because fewer than 10 studies were available for analyses. Figure 3 and supplementary figures 10-13 show the effect of different food sources of fructose-containing sugars on fasting blood glucose. Total fructose-containing sugars independent of food sources had no effect on fasting blood glucose in substitution studies (99 study comparisons, substantial heterogeneity (I2=65%, P<0.001)), addition studies (28, substantial heterogeneity (I2=71%, P<0.001)), subtraction studies (four, substantial heterogeneity (I2=59%, P=0.06)), or ad libitum studies (six, no evidence of heterogeneity). We saw a significant interaction by food source in addition studies (P<0.001): SSBs (11 study comparisons, mean difference 0.12 mmol/L (95% confidence interval 0.03 to 0.22), substantial heterogeneity (I2=74%), P<0.001) and fruit juice (two, 0.29 mmol/L (0.09 to 0.49), no evidence of heterogeneity) showed a significant harmful effect. However, fruit (seven study comparisons), fruit drinks (three), sweetened chocolate (one), added sweeteners (three), and mixed sources (one) showed no significant effect on fasting blood glucose. No significant interaction by food source was seen in the substitution, subtraction, or ad libitum studies, although only one food source category was assessed in the subtraction studies (SSBs) and ad libitum studies (mixed sources). Supplementary table 3 shows the sensitivity analyses for fasting blood glucose. Removal of any one of six addition studies384672105114123 changed the estimates from non-significant to significant, but did not change the magnitude or direction of the effect or the evidence of substantial heterogeneity. Removal of the 2015 subtraction study by Campos and colleagues (group 2)60 explained all of the heterogeneity, changing the direction but not the lack of significance of the effect on fasting blood glucose. Finally, removal of the 2012 subtraction study by Tate and colleagues148 explained most of the heterogeneity (I2=32%, P=0.23) but did not change the direction or lack of significance of the effect on fasting blood glucose. A priori subgroup analyses for fasting blood glucose are presented in supplementary figures 14-17, and dose-response analyses for fasting blood glucose are presented in supplementary figures 8 and 9. We saw significant effect modification by dose of fructose-containing sugars (≤10% energy or >10% energy), with a further threshold effect (25% energy) identified by the MKSPLINE procedure, comparator (starch, glucose, fat, mixed, lactose, dairy), baseline fasting blood glucose (≤5.5 mmol/L or >5.5 mmol/L), feeding control (dietary advice, supplementation, or metabolically controlled), or underlying disease status (otherwise healthy, overweight/obese, diabetes, metabolic syndrome, or non-alcoholic fatty liver disease) in the substitution studies (P<0.05). We also observed a significant subgroup effect by baseline fasting blood glucose (≤5.5 mmol/L or >5.5 mmol/L) in addition studies (P=0.01). None of the subgroup or dose-response analyses explained the substantial heterogeneity in the substitution and addition studies. No subgroup or dose-response analyses were conducted for subtraction or ad libitum comparisons because fewer than 10 studies were available for analyses. Figure 4 and supplementary figures 18-21 show the effect of different food sources of fructose-containing sugars on fasting blood insulin. Total fructose-containing sugars independent of food sources had a harmful effect on fasting blood insulin in addition studies (23 study comparisons, mean difference 4.68 pmol/L (95% confidence interval 1.40 to 7.96), P<0.01, substantial heterogeneity (I2=58%, P<0.001)) and ad libitum studies (four, 7.24 pmol/L (0.47 to 14.00), P=0.04, no evidence of heterogeneity (I2=0%, P=0.46)). We saw no effect in substitution studies (70 studies, substantial heterogeneity (I2=62%, P<0.001)) or subtraction (three, substantial heterogeneity (I2=79%, P<0.01)). We saw a significant interaction by food source in substitution studies (P<0.001). Fruit juice (one study comparison, mean difference −13.89 pmol/L (95% confidence interval −27.50 to −0.28), P=0.05) showed a beneficial effect, and sweetened low fat milk (two, 18.95 pmol/L (9.09 to 28.80), P<0.001, no evidence of heterogeneity) and mixed sources (25, 7.74 pmol/L (2.94 to 12.53), P<0.01, no substantial heterogeneity) showed a harmful effect. Fruit (six study comparisons, no evidence of heterogeneity); dried fruit (one); SSBs (17); baked goods, sweets, and desserts (10, no evidence of heterogeneity); and added sweeteners (eight, substantial heterogeneity (I2=83, P<0.001)) showed no significant effect on fasting blood insulin. No significant interaction by food source was seen in the addition, ad libitum, or subtraction studies, although SSBs accounted for more than 50% of the weighted harm in addition studies and mixed sources was the exclusive food source of fructose-containing sugars in the ad libitum studies. Sensitivity analyses for fasting blood insulin are presented in supplementary table 3. Removal of the 2009 addition study by Hollis and colleagues83 explained some of the heterogeneity (I2=42%, P=0.02) without changing the significance, magnitude, or direction of the effect. Removal of either one of two substitution studies92104 changed the evidence from non-significant to significant without changing the magnitude or direction of the effect or the evidence of substantial heterogeneity. Removal of the subtraction study by Campos and colleagues (group 2)60 explained nearly all of the heterogeneity (I2=1%, P=0.31), changing the significance and magnitude but not the direction of the effect. Removal of the 2000 ad libitum study by Raben and colleagues (C)124 eliminated the evidence for the significance but not the direction of the effect or evidence of no substantial heterogeneity. A priori subgroup analyses for fasting blood insulin are presented in supplementary figures 22-25, and dose-response analyses for fasting blood insulin are presented in supplementary figures 8 and 9. We saw significant effect modification in substitution studies by level of feeding control (dietary advice, supplementation, or metabolically controlled) or by risk of bias for blinding of participants, personnel, and outcome assessors (low, high, or unclear) in the substitution studies (P<0.05). None of the subgroup or dose-response analyses explained the substantial heterogeneity in the substitution studies. No subgroup or dose-response analyses were significant in the addition studies. No subgroup analyses were conducted for the subtraction or ad libitum studies, because fewer than 10 studies were available for analyses. Supplementary figures 26 and 27 show the publication bias assessment for all analyses where at least 10 studies were available. We saw no evidence of publication bias for the effect of food sources of fructose containing sugars on HbA1c, fasting blood glucose, or fasting blood insulin. Although the Begg test was significant (P=0.04), visual inspection of funnel plots and the Egger test did not show evidence of publication bias for the effect of food sources of fructose containing sugars on fasting blood glucose in substitution studies. Adjustment for funnel plot asymmetry by the Duval and Tweedie method also did not alter the results. Table 2 shows a summary of the overall quality of evidence assessment for the effect of total fructose-containing sugars independent of food source on the outcome measures of glycaemic control. The certainty in the evidence was variable for HbA1c (low, low, low, and low quality), fasting blood glucose (low, low, moderate, and moderate), and fasting blood insulin (low, low, low, and moderate) across substitution, addition, subtraction, and ad libitum studies, respectively. Evidence for HbA1c was downgraded for inconsistency in substitution and addition studies; for indirectness in subtraction and ad libitum studies; and for imprecision in substitution, addition, subtraction, and ad libitum studies. Evidence for fasting blood glucose was downgraded for inconsistency in substitution and addition studies; and for imprecision in substitution, addition, subtraction, and ad libitum studies. Similarly, evidence for fasting blood insulin was downgraded for inconsistency in the substitution, addition, and subtraction studies; and for imprecision in substitution, addition, subtraction, and ad libitum studies. Our systematic review and meta-analysis of 155 studies including 5086 participants with and without diabetes showed variable effects of food sources of fructose-containing sugars on three outcome measures of glycaemic control at median doses ranging from 12.2% to 23% of total energy intake over median follow-up durations of 4.5-12 weeks. Four types of study designs were identified on the basis of energy control. In substitution studies, total food sources of fructose-containing sugars in energy matched comparisons with other macronutrients (mainly refined starches) showed a beneficial effect on HbA1c with no effects on fasting blood glucose or insulin, while individual food sources showed decreasing (fruit juice), null (fruit, SSBs, baked goods, added sweeteners), or increasing (sweetened milk, mixed sources) effects on fasting blood insulin. In addition studies, total food sources of fructose-containing sugars supplementing diets with excess energy compared to the same diet alone without the excess energy showed a harmful effect on fasting blood insulin without affecting HbA1c or fasting blood glucose, while individual food sources showed harmful effects on both fasting blood glucose (SSBs and fruit juice) and insulin (SSBs, mixed sources). In the ad libitum studies, total food sources of fructose-containing sugars freely replacing other macronutrients showed a harmful effect on fasting blood insulin (for which the effect was derived exclusively from mixed food sources inclusive of SSBs) without affecting HbA1c or fasting blood glucose. No effect of food sources of fructose-containing sugars was observed in subtraction studies. Our data also agree with evidence from prospective cohort studies of the relation of fructose-containing sugars with diabetes risk. 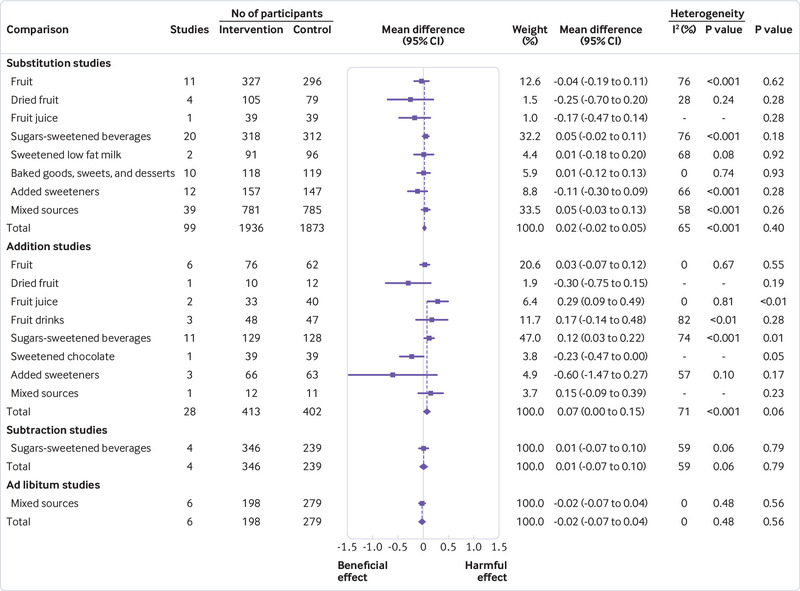 Although we failed to observe an adverse association of total fructose-containing sugars independent of food source with incident diabetes in an earlier systematic review and meta-analysis of the available prospective cohort studies,156 differential associations have been shown for different food sources of sugars. Systematic reviews and meta-analyses of prospective cohort studies have shown an adverse association with SSBs1617 but a protective association with fruit,1819 associations which are consistent with our findings of a harmful effect of SSBs on fasting blood glucose and insulin in addition studies and beneficial effect of fruit on HbA1c in substitution studies. The low GI of fruit could explain why it was the main food source driving a significant improvement in HbA1c in substitution studies, especially when compared with intermediate GI food sources such as SSBs or sweets, which provide calories from sugars in the absence of any nutritional value. The higher fibre content of fruit could contribute to lower postprandial glycaemic excursions. Particularly, viscous gels formed by the pectin in fruit could delay gastric emptying and slow down the release of sugars.163 A secondary analysis of a randomised controlled trial of the effect of a six month, low GI intervention showed that low GI fruit intake was the strongest predictor of HbA1c reduction in people with type 2 diabetes.164 Whether low GI food sources of fructose-containing sugars would show similar effects to those of other low GI carbohydrate foods (including legumes or some whole grains) remains unknown, owing to a lack of studies using high quality carbohydrate comparators. An alternative mechanism accounting for the observed beneficial effects of food sources of fructose-containing sugars on HbA1c in substitution studies relates to a so-called “catalytic” effect of fructose, whereby fructose metabolites have regulatory actions on glucokinase and hepatic glucose uptake. Evidence indicates that fructose, especially at small doses of up to 10 g/meal (a level obtainable from fruit), could improve glycaemia by the ability of fructose-1-P to up regulate glucokinase activity through the glucokinase regulatory protein, resulting in decreased hepatic glucose production165 and increased glycogen synthesis.166 The relevance of this mechanism is unclear. It has not been reliably shown167168 under different experimental conditions, and would be expected to have disproportionally greater effect on fasting blood glucose and insulin than HbA1c, the opposite of what we found in the present study. How dietary fructose interacts with glucose at the level of hepatic glucose homeostasis remains largely underexplored. The lack of a protective effect of interventions to reduce excess energy from food sources of fructose-containing sugars in subtraction studies is unclear. It could represent compensation, in which the decrease in energy from food sources of these sugars are compensated by replacement with energy from other food sources or spontaneous changes in physical activity that decrease energy expenditure, preventing weight loss and its downstream metabolic benefits. Compensation might have been more apparent in these studies because they had the longest median follow-up (12 weeks), and might explain why longer term subtraction studies (with median follow-up of roughly one year) designed to displace excess energy from SSBs have only shown a weight loss benefit in specific subgroups of overweight or obese individuals.180 The instability in the significance of the pooled effect estimates might have also had a role. Removal of the Campos study (group 2)60 explained the heterogeneity showing significant beneficial effects on fasting insulin, suggesting that this study might have masked a true benefit of interventions to reduce fructose-containing sugars. As dietary guidelines shift from a focus on individual nutrients towards a focus on foods and dietary patterns, our findings might have implications for guiding recommendations on important food sources of fructose-containing sugars in the prevention and management of diabetes. As various food sources of these sugars tended to show improvements in HbA1c, consumption of foods such as fruit, yogurt, and whole grain cereals to replace foods high in refined starches within the recommendation to consume no more than 10% of energy from free sugars2232 might be an effective strategy to improve glycaemic control, especially in people with diabetes. As SSBs tended to impair fasting blood glucose and insulin when adding excess energy to the diet, public health strategies to reduce consumption of SSBs could be useful, especially as they provide empty calories in absence of any nutritional value. While these findings highlight the role of food sources of fructose-containing sugars on glycaemic control, other important cardiometabolic parameters should also be considered in future syntheses. Our systematic review and meta-analysis has several strengths. Firstly, we did a comprehensive and reproducible search and selection process of the literature examining the effect of food sources of fructose-containing sugars on glycaemic control. Secondly, collation and synthesis of all the available evidence from a large body (155 studies, n=5086) of controlled intervention studies was performed, providing maximum protection against bias (noting that results did not differ between randomised and non-randomised studies). Thirdly, we included an assessment of overall quality of evidence using the GRADE assessment approach. Several of our analyses presented limitations. Firstly, despite the inclusion of many studies, a limited number of studies used particular food sources. For example, no comparison included sweetened breakfast cereals or yogurt, and only one study comparison was available for sweetened chocolate and two study comparisons for sweetened low fat milk for any of the analyses. Many analyses also had only one or two study comparisons available for inclusion: baked goods, sweets, and desserts for HbA1c in substitution and addition studies (one study); fruit juice for fasting blood glucose and insulin in substitution studies (one); mixed sources for fasting blood glucose and insulin in addition studies (one); SSBs for HbA1c in substitution studies (two); and fruit juice for fasting blood glucose in addition studies (two). As a result, we elected only to do GRADE assessments for total food sources. Secondly, substantial unexplained heterogeneity was present in all analyses for the substitution studies, as well as the addition studies for HbA1c, fasting blood glucose, and fasting blood insulin. Although we also saw substantial heterogeneity in the subtraction studies for HbA1c, fasting blood glucose, and insulin, and ad libitum studies for HbA1c, the removal of individual studies during sensitivity analyses explained this heterogeneity, and so we did not downgrade for inconsistency. Thirdly, serious indirectness was present in some analyses, because only one trial of 240 overweight and obese women was available in the HbA1c subtraction analysis, and similarly, one trial of 10 patients with diabetes was available in the HbA1c ad libitum analysis. Although the small sample sizes of included studies (median ranging from 15 participants in subtraction studies to 39 participants in ad libitum studies) are another potential source of indirectness, we did not downgrade the evidence for indirectness owing to the large number of included studies, representing a diverse range of study conditions and metabolic phenotypes across many participants. We also did not downgrade for indirectness because of the relatively short duration of follow-up (median 4.5-12 weeks), and we believed that it was sufficient to assess the question of harm (a decision shared with an earlier WHO commissioned review of the evidence for sugars and body weight).181 Finally, we saw evidence of serious imprecision in all of the analyses. As the 95% confidence intervals crossed the minimally important differences for HbA1c, fasting blood glucose, and fasting blood insulin, these analyses were downgraded for serious imprecision. Weighing the strengths and limitations, we graded the quality in the evidence using GRADE as low for HbA1c, low to moderate for fasting blood glucose, and low to moderate for fasting blood insulin across the four study designs based on energy control. The effects of food sources of fructose-containing sugars on glycaemic control appear to be both energy and food source dependent. Food sources of fructose-containing sugars, especially fruit, substituted for equal amounts of calories from other macronutrient sources (mainly refined starches) led to improvements in HbA1c without adversely affecting fasting blood glucose or insulin. However, when several food sources of fructose-containing sugars added excess energy to the diet, especially SSBs, significant increases in fasting blood glucose and insulin were observed. The same result was also seen for mixed food sources (inclusive of SSBs) of fructose-containing sugars freely replacing other macronutrients on fasting blood insulin without a harmful effect on HbA1c or fasting blood glucose. The anticipated benefit of interventions to reduce the excess energy from sugars, however, was not seen reliably, suggesting that compensatory behaviours might be an important consideration. The lack of any harm and even advantages were most pronounced in those individuals with higher HbA1c and fasting blood glucose at baseline or who had diabetes. Although our findings suggest that common food sources of fructose-containing sugars do not have harmful effects on glycaemic control in energy matched replacement of other less sugary foods, our GRADE assessment suggests that more research is likely to have an important influence on many of our estimates. More large, high quality studies using a greater variety of food sources of fructose-containing sugars are required to assess the durability of these effects and understand whether certain food sources with an apparent signal for benefit, such as fruit, might even have advantages for glycaemic control under free living conditions over the longer term (six months or longer). Meanwhile, policy and guidelines makers should consider the influence of energy control and food source in the development recommendations to reduce sugars for the prevention and management of diabetes. We thank Zujaja-Tul-Noor for her help in creating some of the figures. Aspects of this work were presented at the 34th International Symposium on Diabetes and Nutrition, Diabetes and Nutrition Study Group of the European Association of the Study of Diabetes, in Prague, Czech Republic (29 June to 1 July 2016). Contributors: VLC, SBM, and JLS had full access to all of the data in the study and take responsibility for the integrity of the data and the accuracy of the data analysis. VLC, JLS, and DJAJ were responsible for the study concept and design. VLC, EV, SBM, AIC, VH, LAL, TMSW, TAK, DJAJ, and JLS were responsible for the acquisition, analysis, and interpretation of data. VLC drafted the manuscript. All the authors contributed to the critical revision of the manuscript for important intellectual content. VLC and SBM conducted the statistical analysis. JLS and DJAJ supervised the study. JLS was the study guarantor. The corresponding author attests that all listed authors meet authorship criteria and that no others meeting the criteria have been omitted. Funding: This work was funded by Diabetes Canada (grant CS-5-15-4771-JS). The Diet, Digestive tract, and Disease (3D) Centre, funded through the Canada Foundation for Innovation and the Ministry of Research and Innovation’s Ontario Research Fund, provided the infrastructure for the conduct of this work. DJAJ was funded by the Government of Canada through the Canada Research Chair Endowment. JLS was funded by the PSI Graham Farquharson Knowledge Translation Fellowship, Diabetes Canada Clinician Scientist award, Canadian Institutes of Health Research’s Institute of Nutrition, Metabolism, and Diabetes-Canadian Nutrition Society (CIHR INMD-CNS) New Investigator Partnership Prize, and Banting and Best Diabetes Centre Sun Life Financial New Investigator Award. None of the sponsors had a role in any aspect of the present study, including design and conduct of the study; collection, management, analysis, and interpretation of the data; and preparation, review, approval of the manuscript or decision to publish. Competing interests: All authors have completed the ICMJE uniform disclosure form at www.icmje.org/coi_disclosure.pdf and declare: support from Diabetes Canada and the Diet, Digestive tract, and Disease Centre through the Canada Foundation for Innovation and the Ministry of Research and Innovation’s Ontario Research Fund for the submitted work. TMSW is a part owner and president of Glycemic Index Laboratories, Toronto, Canada, and has authored several diet books on the glycaemic index for which he has received royalties from Phillipa Sandall Publishing Services and CABI Publishers; and has received consultant fees, honorariums, travel funding, or research support from or served on the scientific advisory board for Canadian Institutes of Health Research, Canadian Diabetes Association, Dairy Farmers of Canada, McCain Foods, Temasek Polytechnic, Northwestern University, Royal Society of London, Glycemic Index Symbol programme, CreaNutrition AG, McMaster University, Canadian Society for Nutritional Sciences, National Sports and Conditioning Association, Faculty of Public Health and Nutrition—Autonomous University of Nuevo Leon, and Diabetes and Nutrition Study Group of the European Association for the Study of Diabetes. VV has a Canadian (2 410 556) and American (7,326.404) patent on the medical use of viscous fibre blend for reducing blood glucose for treatment of diabetes, increasing insulin sensitivity, and reduction in systolic blood pressure and blood lipids issued. CWCK has received grants or research support from the Advanced Food Materials Network, Agriculture and Agri-Foods Canada, Almond Board of California, American Pistachio Growers, Barilla, Calorie Control Council, Canadian Institutes of Health Research, Canola Council of Canada, International Nut and Dried Fruit Council, International Tree Nut Council Research and Education Foundation, Loblaw Brands, Pulse Canada, Saskatchewan Pulse Growers and Unilever; has received in-kind research support from the Almond Board of California, American Peanut Council, Barilla, California Walnut Commission, Kellogg Canada, Loblaw Companies, Quaker (PepsiCo), Primo, Unico, Unilever, WhiteWave Foods; has received travel support or honorariums from the American Peanut Council, American Pistachio Growers, Barilla, California Walnut Commission, Canola Council of Canada, General Mills, International Nut and Dried Fruit Council, International Pasta Organization, Loblaw Brands Ltd, Nutrition Foundation of Italy, Oldways Preservation Trust, Paramount Farms, Peanut Institute, Pulse Canada, Sabra Dipping, Saskatchewan Pulse Growers, Sun-Maid, Tate & Lyle, Unilever and White Wave Foods; has served on the scientific advisory board for the International Tree Nut Council, International Pasta Organization, McCormick Science Institute, Oldways Preservation Trust, Paramount Farms and Pulse Canada; is a member of the International Carbohydrate Quality Consortium, executive board member of the Diabetes and Nutrition Study Group of the European Association for the Study of Diabetes; is on the Clinical Practice Guidelines Expert Committee for Nutrition Therapy of the European Association for the Study of Diabetes; and is a director of the Toronto 3D Knowledge Synthesis and Clinical Trials Foundation. RJdS has received research support from the Canadian Foundation for Dietetic Research, Population Health Research Institute, and Hamilton Health Sciences Corporation; travel and consultant fees from the World Health Organization; consultant fees from Canadian Institutes of Health Research’s Institute of Nutrition, Metabolism, and Diabetes and Health Canada; and a speaker’s honorarium from McMaster Children’s Hospital. DJAJ has received research grants from Saskatchewan Pulse Growers, the Agricultural Bioproducts Innovation Programme through the Pulse Research Network, Advanced Foods and Material Network, Loblaw Companies, Unilever, Barilla, Almond Board of California, Agriculture and Agri-food Canada, Pulse Canada, Kellogg’s Company (Canada), Quaker Oats (Canada), Procter and Gamble Technical Centre, Bayer Consumer Care (Springfield, NJ, USA), Pepsi/Quaker, International Nut and Dried Fruit, Soy Foods Association of North America, Coca-Cola Company (investigator initiated, unrestricted grant), Solae, Haine Celestial, Sanitarium Company, Orafti, International Tree Nut Council Nutrition Research and Education Foundation, Peanut Institute, Soy Nutrition Institute, Canola and Flax Councils of Canada, Calorie Control Council, Canadian Institutes of Health Research, Canada Foundation for Innovation, and Ontario Research Fund; has received in-kind supplies for trials as a research support from the Almond board of California, Walnut Council of California, American Peanut Council, Barilla, Unilever, Unico, Primo, Loblaw Companies, Quaker (PepsiCo), Pristine Gourmet, Bunge, Kellogg Canada, and WhiteWave Foods; has been on the speaker’s panel, served on the scientific advisory board or received travel support or honorariums from the Almond Board of California, Canadian Agriculture Policy Institute, Loblaw Companies, Griffin Hospital (for the development of the NuVal scoring system), Coca-Cola Company, EPICURE, Danone, Diet Quality Photo Navigation, Better Therapeutics (FareWell), Verywell, True Health Initiative, Institute of Food Technologists, Soy Nutrition Institute, Herbalife Nutrition Institute, Saskatchewan Pulse Growers, Sanitarium Company, Orafti, Almond Board of California, American Peanut Council, International Tree Nut Council Nutrition Research and Education Foundation, Peanut Institute, Herbalife International, Pacific Health Laboratories, Nutritional Fundamentals for Health, Barilla, Metagenics, Bayer Consumer Care, Unilever Canada and Netherlands, Solae, Kellogg, Quaker Oats, Procter and Gamble, Abbott Laboratories, Dean Foods, California Strawberry Commission, Haine Celestial, PepsiCo, Alpro Foundation, Pioneer Hi-Bred International, DuPont Nutrition and Health, Spherix Consulting and WhiteWave Foods, Advanced Foods and Material Network, Canola and Flax Councils of Canada, Agri-Culture and Agri-Food Canada, Canadian Agri-Food Policy Institute, Pulse Canada, Saskatchewan Pulse Growers, Soy Foods Association of North America, Nutrition Foundation of Italy, Nutra-Source Diagnostics, McDougall Programme, Toronto Knowledge Translation Group (St Michael’s Hospital), Canadian College of Naturopathic Medicine, The Hospital for Sick Children, Canadian Nutrition Society, American Society of Nutrition, Arizona State University, Paolo Sorbini Foundation, and the Institute of Nutrition, Metabolism, and Diabetes; has received an honorarium from the US Department of Agriculture to present the 2013 W O Atwater Memorial Lecture and the 2013 Award for Excellence in Research from the International Nut and Dried Fruit Council; has received funding and travel support from the Canadian Society of Endocrinology and Metabolism to produce mini cases for the Canadian Diabetes Association; and is a member of the International Carbohydrate Quality Consortium. DJAJ’s wife, Alexandra L Jenkins, is a director and partner of Glycemic Index Laboratories, and his sister, Caroline Brydson, received funding through a grant from the St Michael’s Hospital Foundation to develop a cookbook for one of his studies. JLS has received research support from the Canadian Institutes of Health Research, Diabetes Canada, PSI Foundation, Banting and Best Diabetes Centre, American Society for Nutrition, INC International Nut and Dried Fruit Council Foundation, National Dried Fruit Trade Association, the Tate and Lyle Nutritional Research Fund at the University of Toronto, the Glycemic Control and Cardiovascular Disease in Type 2 Diabetes Fund at the University of Toronto (a fund established by the Alberta Pulse Growers), and the Nutrition Trialists Fund at the University of Toronto (a fund established by the Calorie Control Council); has received food donations to support randomised controlled trials from the Almond Board of California, California Walnut Commission, American Peanut Council, Barilla, Unilever, Unico/Primo, Loblaw Companies, Quaker (PepsiCo), Kellogg Canada, and WhiteWave Foods; has received speaker fees or honorariums from Diabetes Canada, Canadian Nutrition Society, Mott’s, Dairy Farmers of Canada, Alberta Milk, FoodMinds, Memac Ogilvy & Mather, PepsiCo, The Ginger Network, International Sweeteners Association, Nestlé, Pulse Canada, Canadian Society for Endocrinology and Metabolism, GI Foundation, Barilla Centre for Food and Nutrition, Abbott, Biofortis, California Walnut Commission, American Society for Nutrition, Loma Linda University, Dietitians of Canada, European Food Safety Authority, and Physicians Committee for Responsible Medicine; has ad hoc consulting arrangements with Winston and Strawn, Perkins Coie, and Tate and Lyle, and Wirtschaftliche Vereinigung Zucker eV; is a member of the European Fruit Juice Association’s scientific expert panel; is on the clinical practice guidelines expert committees of Diabetes Canada, European Association for the Study of Diabetes, Canadian Cardiovascular Society, and Obesity Canada; serves as an unpaid scientific adviser for the Food, Nutrition, and Safety Programme and the technical committee on carbohydrates of the International Life Science Institute North America; and is a member of the International Carbohydrate Quality Consortium, executive board member of the Diabetes and Nutrition Study Group of the European Association for the Study of Diabetes, and director of the Toronto 3D Knowledge Synthesis and Clinical Studies foundation. JLS’s wife is an employee of Unilever Canada. VLC, EV, SBM, AIC, TAK, VH, and LAL declare no competing interests. There are no products in development or marketed products to declare.
. Increased levels of plasma insulin and eleven hydroxycorticosteroid induced by sucrose, and their reduction by phenformin. Hormone Metab Res1972;4:417-20. Scientific Advisory Committe on Nutrition. Carbohydrates and health. Stationery Office. 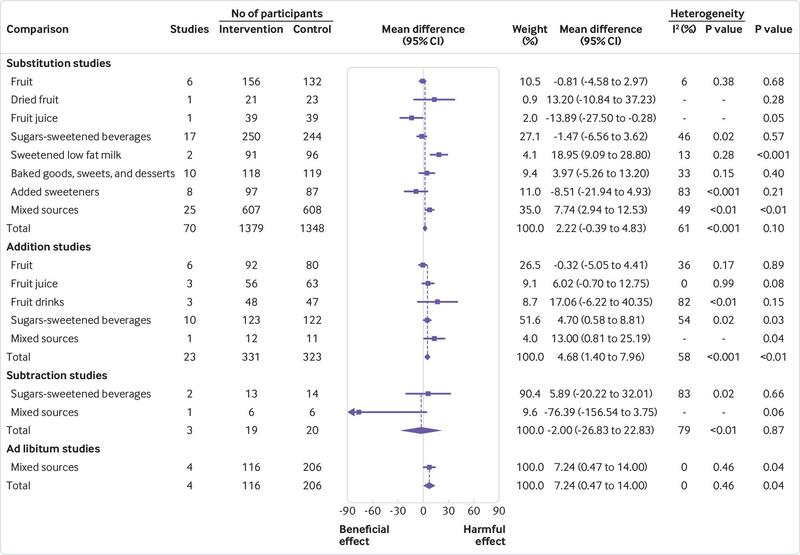 2015. https://www.gov.uk/government/uploads/system/uploads/attachment_data/file/445503/SACN_Carbohydrates_and_Health.pdf.
. Introduction to meta-analysis.John Wiley & Sons, 2008. US Department of Health and Human Services and US Department of Agriculture. 2015-2020 dietary guidelines for Americans. 8th ed. December 2015. https://health.gov/dietaryguidelines/2015/guidelines/. USDA. Scientific Report of the 2015 Dietary Guidelines Advisory Committee. In: DGAC-USDA, ed. 2015. https://health.gov/dietaryguidelines/2015-scientific-report/pdfs/scientific-report-of-the-2015-dietary-guidelines-advisory-committee.pdf.
. Dietary reference intakes for energy, carbohydrate, fiber, fat, fatty acids, cholesterol, protein, and amino acids.National Academies Press, 2005.
. Effets métaboliques de la consommation quotidienne pendant un an de saccharose ou de fructose par des diabétiques. Med Nutr1990;26:11-4.
. A randomized-controlled clinical trial of high fructose diets from either Robinia honey or free fructose and glucose in healthy normal weight males. Clin Nutr ESPEN2017;19:16-22doi:10.1016/j.clnesp.2017.01.009.
. The role of pure honey in the treatment of diabetes mellitus. Biomedical Research (India)2017;28:3305-12. No difference between high-fructose and high-glucose diets on liver triacylglycerol or biochemistry in healthy overweight men. Gastroenterology2013;145:1016-25 e2.
. Moderate amounts of sucrose with mixed meals do not impair metabolic control in patients with type II (non-insulin dependent) diabetes. Diabetes Nutr Metab1989;2:133-7.
. Leptin is influenced both by predisposition to obesity and diet composition. Int J Obes Relat Metab Disord2000;24:450-9. Randomized controlled trial of changes in dietary carbohydrate/fat ratio and simple vs complex carbohydrates on body weight and blood lipids: the CARMEN study. The Carbohydrate Ratio Management in European National diets. Int J Obes Relat Metab Disord2000;24:1310-8.
. Effects on plasma ascorbic acid and coronary risk factors of adding guava fruit to the usual diet in hypertensives with mild to moderate hypercholesterolaemia. J Nutr Environ Med1997;7:5-14doi:10.1080/13590849762754. Relation of total sugars, fructose and sucrose with incident type 2 diabetes: a systematic review and meta-analysis of prospective cohort studies. CMAJ2017;189:E711-20.